Today, FarmEcon LLC released RFS, Fuel and Food Prices, and the Need for Statutory Flexibility, a study of ethanol’s impact on food and fuel prices. FarmEcon prepared the study for the American Meat Institute, California Dairies Inc., Milk Producers Council, National Cattlemen’s Beef Association, National Chicken Council, National Pork Producers Council, and National Turkey Federation. The study argues that the Renewable Fuel Standard (RFS), commonly known as the ethanol mandate, is detrimental to both non-ethanol industry corn users and food and fuel consumers. The program should therefore be reformed. The RFS has “destabilized corn and ethanol prices by offering an almost risk-free demand volume guaranty to the corn-based ethanol industry.” Consequently, food producers who use corn as a feedstock “have been forced to bear a disproportionate share of market and price risk” when corn yields fall and prices rise. This has become painfully obvious in recent weeks as drought conditions in the Midwest depress yields and push corn prices to record highs. Increases in ethanol production since 2007 have made little, or no, contribution to U.S. energy supplies, or dependence on foreign crude oil. Rather, those increases have pushed gasoline suplies into the export market. On an energy basis, ethanol has never been priced competitively with gasoline. Ethanol production costs and prices have ruled out U.S. ethanol use at levels higher than E10. As a result, we exported 1.2 billion gallons of ethanol in 2011. Due to its higher energy cost and negative effect on fuel mileage, ethanol adds to the overall cost of motor fuels. In 2011 the higher cost of ethanol energy compared to gasoline added approximately $14.5 billion, or about 10 cents per gallon, to the cost of U.S. gasoline consumption. Ethanol tax credits (since discontinued) added another 4 cents per gallon. Ethanol typically sells for less per gallon than gasoline, but “engines do not run on gallons, they run on energy,” and a gallon of ethanol has only 67% of the net energy in a gallon of gasoline. The RFS has dramatically altered U.S. corn markets. Corn prices have increased from $2.00 a bushel in 2005/2006 to $6.00 a bushel in 2011/2012. Corn use for ethanol increased from 1.6 billion bushels in 2005/2006 to 5.0 billion in 2011/2012. Feed use of corn declined from 6.2 billion bushels in 2005/2006 to an estimated 4.6 billion in 2011/2012. Corn exports declined from 2.1 billion bushels in 2005/2006 to an estimated 1.7 billion bushels in 2011/2012. Corn is a key commodity used by meat, poultry, and dairy producers. Corn prices also influence wheat, soybeans, and other commodities, because corn competes with those crops for customers and/or land. The cost of corn, wheat, and soybeans used in U.S. food production has risen from $26.5 billion in 2005, when the first RFS was enacted, to $69.5 billion in 2011. “The cumulative cost increase over 2005-2011 was $141.9 billion.” Higher energy prices also played a significant role. Nonetheless, the RFS mandates were an important factor. Like the MIT study I reviewed earlier this week, the FarmEcon study rejects the ‘finding’ of Iowa State University researchers that ethanol, by expanding the U.S. motor fuel supply, reduced the crack spread (refiner profit margin) by $1.09 per gallon in 2011, sparing consumers an equivalent increase in pain at the pump. FarmEcon offers a critique based on statistical models but also presents an Econ 101 argument: “The 2000-2011 average gasoline crack price spread was 27.8 cents per gallon. The 2011 margin averaged 37.1 cents. A $1.09 increase in that margin would lead to refineries quickly increasing gasoline production and reducing gasoline exports. The increase in gasoline supply available to the U.S. market would largely, likely entirely, wipe out the higher gasoline price.” In other words, the market is self-correcting. Refiners don’t need big-daddy government to tell them to produce more fuel when demand increases faster than supply and prices rise. * The reform examined in the study, proposed by Rep. Bob Goodlatte (R-Va.), would relax the RFS targets as the corn stocks-to-use ratio declines below 10%. Stocks-to-use measures the quantity (“stock”) of a commodity at the end of a particular time period as a percentage of total use of the commodity during that time period. TradingCharts.Com explains how a stocks-to-use ratio is calculated. . . . . beginning stocks represent the previous year’s ending or carryover inventories. Total production represents the total grain produced in a given year. Total usage is the sum of all the end uses in which the stock of grain has been consumed. This would include human consumption, export programs, seed, waste, dockage and feed consumption. By adding carry-over stocks to the total production you will obtain the total supply. From the total supply, subtract the total use and the resultant figure will be the year ending carryover stock. The carryover stock divided by the total usage can be expressed as a ratio which when compared with previous years gives the market analyst an indication of the relative supply/demand balance for a particular commodity. This ratio can then be used to indicate whether current and projected stock levels are critical or plentiful.The ratio can also be used to indicate how many days of supply are available to the world marketplace under current usage patterns ( eg. a 20% stocks to use ratio for wheat indicates that there are 75 days supply of wheat in reserve). a 50% reduction if stocks-to-use is below 5%. 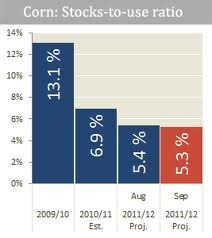 According to FarmEcon, corn stocks-to-use in 2010/2011 was 6.2% and in 2011/2012 is 6.7%. In both crop years, the RFS target would be reduced by 15% under Goodlatte’s proposal. Rep Goodlatte voted to enact the RFS in 2005. It was a huge mistake, because the ethanol subsidies have only added to our National Deficit. Not to mention increased food costs increase the size of the ‘ta da’ Food Stamp program, more debt. Increased food cost drains cash from the Middle Class in their grocery bills (hello can’t get out of the recession), and finally when Congress and Goodlatte create a problem.. what do they do? The right thing and eliminate the RFS? NO, they reform it… yes they help the lobbyists, and keep their political $$$ in play for Congressional terms to come… Tax payer pffft! They don’t have the staying power of the lobbyists! My Congressman was elected in 1992 to fight big Govt! Now he is big Govt… why his reform would give more power to Free Enterprise? NO! It will give power to the USDA! The EPA (U.S. government) must end or suspend this industry welfare mandate. If they do for any length of time consumers would see improved gas mileage (ethanol only contains 66.6% the energy of gasoline. Al Gore has led us down the wrong road for too long. Wake up people the government is never here to help us. I’m a retired Independent Petroleum Consulant (spent 24 years with Mobil Oil Corp.) I just viewed a show called This Week in Ag Business on the RFD channel on Direct TV. Their “experts” made the statement that adding ethanol to gasoline had saved consumers approximately $1.00+ per gallon at the pump in the past couple of years. I had to laugh to keep from crying. I’ve worked in the oil industry for 40+ years, and have two very close personal friends who are major shareholders in ethanol refineries, (one is a Chemical Engineer). I knew that if you included all of the costs involved in ethanol production (even if you discount the government subsidies of taxpayer’s money), from the farmer’s cost, all transportation, marketing costs, refining costs, all overhead, cost to blend to the regular gasoline….there is no way this cost would be competetive with straight gasoline. So….I found your site in doing some research and found everything I had thought to be confirmed by your article, (as well as other linked articles from major studies by very reputable research organizations). Thanks for putting the truth out for the public to see. Question is, how can we get this information passed to the consumer by the main stream media, so they can put enough pressure on their congressmen to reform the present policy? You know this is very politically incorrect information, unwanted by most of the left wing liberals and environmentalist, as well as everyone who stands to profit from the current RFS policy. Wishing you success in spreading the truth, Sincerely, Larry T. Simmons, 892 Ewell Cooley Road, DeRidder, La 70634..337-462-2048. So let me get this straight… Several meat and dairy organizations commissioned a study that happened to find in their favor, and we’re supposed to believe that this is a coincidence? Of course they want to discourage corn prices going up – they need cheap corn to feed their livestock! What if a bunch of anti-gay organizations got together and commissioned a study about gays and the study found negative statistics about them? This study is biased, and no matter what people feel about gasoline, it is an nonrenewable resource that will eventually disappear. We need alternatives, and corn is renewable. Maybe if we didn’t feed 70% of all the grains grown in this country to livestock, we could eat it ourselves and bring down the price of corn. Next post: When Drought Strikes, Should U.S. Policy Endanger Hungry People?